We’re Hiring — Join us! We are adding a role to our Development Team — Leadership Giving Manager. Learn how to apply below. 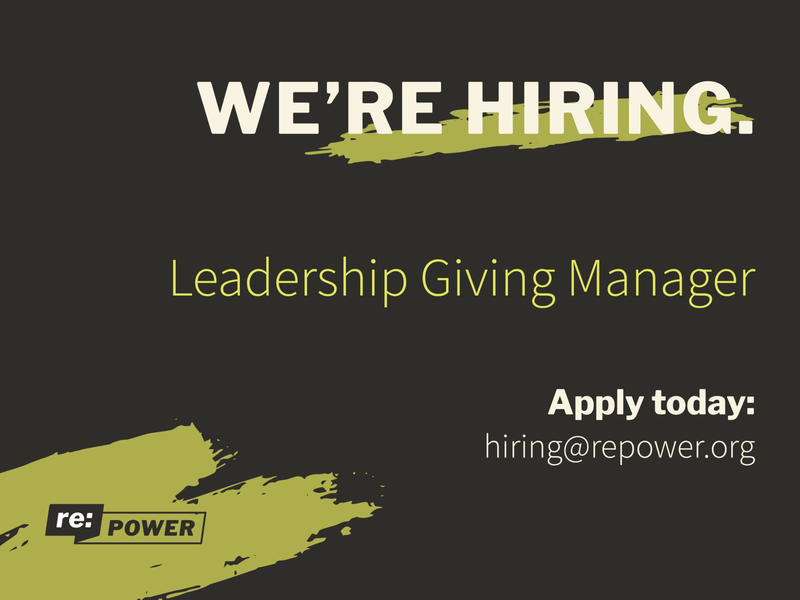 As the Leadership Giving Manager, you will be the owner of securing annual and planned gifts from current major donors, stewarding deeper investments and cultivating new connections in an effort to diversify re:power’s major gifts portfolio. You will be joining a newly re-branded organization and work closely with the VP, Development and Executive Director to manage major donor relationships as we bring them along in our vision and mission. And, with re:power’s clear lens on inclusive representation, you will be part of a development team working toward disrupting the structures and practices that prohibit inclusivity in philanthropy. Drafting a clear direct ask plan in consultation with the VP, Development, working toward the goal of increasing the overall number and gift amounts of donors in the portfolio. Soliciting, closing, and acknowledging gifts. Developing and implementing a major donors recognition program aligned with re:power’s core values of an inclusive democracy. Implementing practices to maintain strong stewardship relationships with donors, like personal email updates, phone calls, and hand-written acknowledgements. Create materials and strategy for a planned giving program. Create a plan to better align re:power’s majors donors with our mission and values, specifically looking to diversify our list by adding more people of color, women, LGBTQ folks, and young people. Be willing to push against major donor practices that perpetuate the habits of white supremacy and guide our major donors in understanding this work. Find ways to bring major donors closer to our work while ensuring their presence (whether physical or not) does not co-opt space form those we serve. Create spaces for open and honest discussions with major donors about our work and our values. Guide the rest of staff in “best practices” related to working with donors and combatting the habits of white supremacy. Work closely with other members of the Development Team (Grassroots Giving Manager, Foundations & Sponsorships Manager & VP, Development) to execute the overall vision and goals of the team, understanding when to lead and when to support. Help to lead the Development Team, Executive Director and/or board members in closing major donor giving and establishing new relationships. Collaborate with Communications to develop and create professional and compelling fundraising materials. Be present and engaged during our three all-staff retreats and at least one team retreat each year. Organizational leadership: Lead by example by modeling a high bar for performance and living our values; operate with the best interests of the organization in mind, and not simply the best interests of your team. Ownership: You care deeply about getting results in your realm, and you do what it takes to get them, including paying attention to even small details, anticipating problems, offering creative solutions, driving work forward, and course-correcting when needed. Sustainable growth mentality: You’re consistently developing strategies to sustainably grow the amount and type of support from donors and funders and up for trying out new initiatives to bring more folks into our giving program. You view the work of Development as a vital piece of the puzzle, not simply as the fundraising arm of the organization. You believe that work with donors can and should be grounded in the mission and values of the organization. Committed to progressive, inclusive leadership, including valuing and prioritizing work with diverse coalitions and communities. Highly relational, with a strong belief in the importance of relationship-building for success, both internally and externally. Tenacious and flexible, with a “getting to yes” attitude and a propensity for working through roadblocks and achieving your goals. Anticipatory and data-driven: you look ahead, alerting staff to trends, deadlines, and upcoming opportunities and using data to make decisions about where to best direct our time and attention in stewarding this work. High standards and peak performance: a drive toward ambition and delivering excellent work, including the ability to manage and successfully execute multiple projects simultaneously, both directly and through your team. Strong self-initiative and the ability to work independently; able to own significant projects and follow through to completion without heavy day-to-day supervision. Thoughtful, strategic leadership combined with energy to do the day-to-day work of program delivery. Openness to giving and receiving feedback for continuous learning, evolution, and improvement: you’re committed to building your own skills as well as building the skills and capacity of your colleagues. Deep and demonstrated commitment to racial, social, economic, and gender justice. Willingness to challenge, re-think, and re-shape the practices of major donor development that perpetuate habits of white supremacy. Compensation for this position is competitive, with a starting salary of $75,000 annually. Benefits are comprehensive, with 90%-employer-paid health and dental insurance premiums for staff and their families; 100%-employer-paid life and disability insurance; exceptionally generous and flexible paid time off; 401k retirement benefits with a 4% employer match; FSA enrollment; 12 weeks of paid parental leave; 12 weeks of paid sabbatical leave; and much more. re:power offers a lively and highly rewarding professional environment. This position can be located anywhere in the United States convenient to regular travel. This position is open until filled, and applications will be reviewed on a rolling basis. Please email your letter of interest and resume in a single pdf document to hiring@repower.org by May 3, 2019. Please be sure to specify Leadership Giving Manager in your subject line. For more about our work, go to www.repower.org. We believe in a future of inclusive politics where decisions about our communities are made by our communities at all levels.